One of his most interesting works is the “100 x 100” (2006). 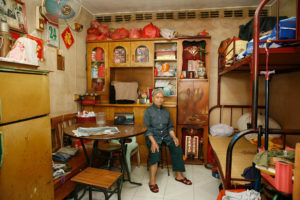 For this project he portrayed the 100 inhabitants of the oldest public housing estate of Hong Kong, the Shek Kip Mei Estate. This building was built on a plot of only 100 square meters after a fire left thousands of people homeless in the 1950s. 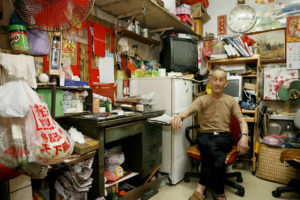 It provided exactly 100 rooms for some of these people, with less than 10 square meters to live in (source: http://www.coolhunting.com/culture/michael-wolf-10). Wolf shot each photo from the same angle, so that the spectator is faced with the enormous diversity and individuality within the building. Over and over again, Wolf shows us one resident who is enveloped by their room, surrounded by their belongings which are piled up to the ceiling. Their situation is in no way comparable to ours, but I do think that these photos give us insights into how we can strengthen our position in life by daring to be independent. Within these photos we can recognize the individuality we also face in our own lives, especially for those who live in the city. In the city people live together on a relatively small space, but there is a sense of estrangement. Citizens rush around, their face hidden behind a smartphone, wearing earplugs and rarely making contact with others. In the Canvasconnectie the photographer explains that he wondered how these people could make do on such a small space, but during his project he became aware of the fact “that space isn’t ultimately that important, but your community is.”(source: https://vimeo.com/92597595 (password: dcc)) This building, stuffed with tiny rooms, provides an enormous network. This network, or community, means safety for the inhabitants of this building, because they can rely on each other. Although we don’t live in the same circumstances as these people, we also need a network on which we can rely. I would say that everyone is as strong as their network is. 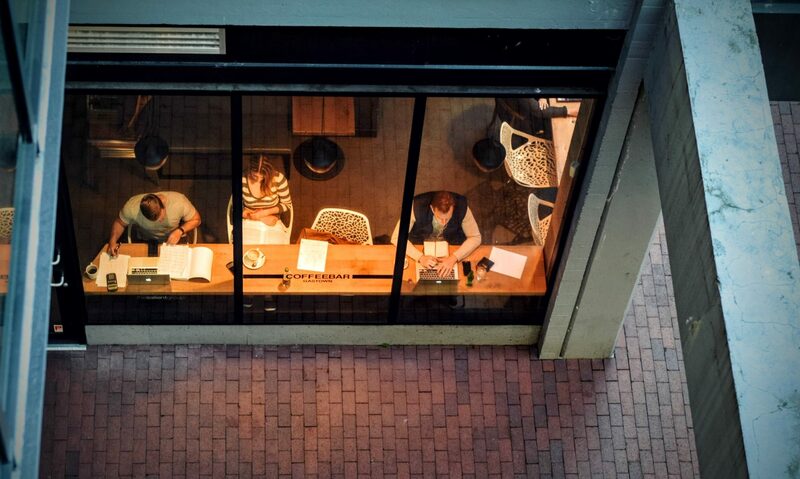 As a student, about to write your thesis and grow into the role of a young professional you certainly need to be aware of the importance of your network. Your network secures your position in life and makes your feel more confident towards life. A network means having people you can fall back on, people who challenge you to develop yourself and people who bring you to the next step in life. Therefore, it’s essential to build a network. I will encourage you to always build and expand it. When you have your network secured, you definitely feel more confident in your abilities to finish your thesis and to pursue your ambitions. Scriptiewijzer guides students while writing their thesis. We encourage those students who get lost in their thesis. We offer what is necessary: structure, simple steps and support in order to make them finish their thesis. Scriptiewijzer is part of buro dijkstra. At buro dijkstra we guide students and young professionals while finding their place in life. We encourage in order to enable the next step in their lives.